There are just some things in life that come without any warning. There is no explanation, no “how to” manual, no preparation. Like attending the birthday party of a beautiful little one year old boy. Whose Momma is the childhood friend of your first born child. In a room full of people you knew when they were teething. Who are now cuddling their own babies on their laps. I went to just such a party this weekend, and it was lovely! The little guy was happy, healthy, sweet and smiling. He was happy to thrust both chubby little hands into the home made cake that his Mommy placed on his highchair tray. His loving Auntie snapped photos and his Uncle laughed from across the room. And I smiled and cheered and watched him with joy. And I wondered what the hell hell has happened to the past 20 years. You see, the Grandma of this sweet boy (who is MUCH YOUNGER than me….just sayin’) is one of the first friends that I made in this town, back when my young family moved here 23 years ago. I met her at a “Daisy Girl Scouts” meeting, where our five year old daughters were learning to do crafts and make little treats. We waited for the meeting to end, and she introduced herself to me in the hallway outside of the meeting room. I held my 3 month old son in my arms, and she was pregnant and soon to deliver her third child. Our girls became friends, our boys became friends, and she and I became great friends. Over all of these years, we have shared birthday parties, bouts of strep, school vacations, the teen years and the college application process. None of that really bothered me until yesterday. There I stood, happily rocking a sweet, blonde five month old girl in my arms. Looking on as her Mommy chatted with my daughter. Her Mommy….whom I first met when she was six……!!!! There has been nothing in my life so far that has prepared me for a room full of children taking care of their children. For God’s sake! I knew those Mommies when they didn’t know how to tie their own shoes! I knew those Daddies when they were crying because they lost a tooth! I cheered them on through elementary school plays, and high school concerts and more sporting events than I could begin to count! I knew them with braces, and zits and awkward teenaged romances! I knew them before they could drive……. Hey, I knew them when they needed binkies of their own to fall asleep. I stood there yesterday, in the beautiful home of that beautiful young Mother, smiling at her beautiful child. How did I miss the last 20 years, and why didn’t anyone prepare me for this moment? Seriously. This is how I remember them. Life’s short and then, Boom! Not so bad though…new roles, new adventures. Truth is, the little girl whose birthday party Barney was crashing told me recently that she was “scared to death” of him that day! She is the Aunt of the baby boy, and Barney was a good friend of ours! Phew, the years do fly……. On the bright side, think of how great it is that you get to be a part of the next generation! That you get to see the “babies” you knew with their own babies. The fact that we have all stayed in touch, and gone on to have such happy lives is so great. I know, I know, I do!! But I still miss 1994 sometimes, and I want it back just for a minute! I just felt overwhelmed in that moment…..! Do you think it scares us because of the speed ball that’s in front of us?? It’s too weird at times for me, too, after 34 years in the same place. I do think that’s part of it! The inevitable and uncontrollable forward thrusters that keep moving us past our own lives, in a weird way…. Thank you, and welcome aboard!!! Enjoy your wee ones, my dear! IN all the craziness and all the hectic rushing, hold onto those magic little moments! This is a lovely post. Yes nothing prepares us. My boy is turning 18 this month and my mind and my heart is full of memories. I know I will stand in the kitchen when all the ‘kids’ come back from his bowling party and I watch them open a beer, tuck into the pizza and my mind will go back to that time when they were little. But I’ll tell you what. How lucky are we to have had such pleasures in life. We are, indeed, so lucky. I know too many people who don’t have this chance with their kids, for many reasons. I cherish these moments, truly, even as I miss the ones that came before. Happy almost birthday to Spencer! My ‘babe’ will turn 21 in June…….?!? When I was a young teen, I baby-sat the toddler son of my former babysitter. It was odd, but kind of fun. I think that I am the queen of the ambivalent reaction: I am so happy to still be around them all, to actually have the pleasure of holding those babies! But I still miss my own babies…..
Doesn’t sound like you missed any of it – you were there for it all! As it sped right by me…..
That’s so cute! “Tag you’re it” is right….. Such a time warp moment! We (G&F) are not there yet – not even close – but how amazing that you have the chance to spend a lifetime watching your children and their friends grow up and become adults, marry, and have children of their own. What a gift you have been given of your own long and healthy life, with more to come, one hopes! A couple of months ago I spent time with a friend playing with her granddaughter Lilly. Lilly’s daddy is a good friend of Jake’s and someone who played hockey with Jake and Tim. Time flies, but I just love seeing the big strapping young men holding the itty bitty babies and listening to these “tough guys” cooing and smiling and beaming with joy and love that parenthood has brought them, the same way we feel when looking at them. I know, Beth, and you’re right! I love still having Kate’s friends in our lives, and being included in these wonderful moments. Love this post. 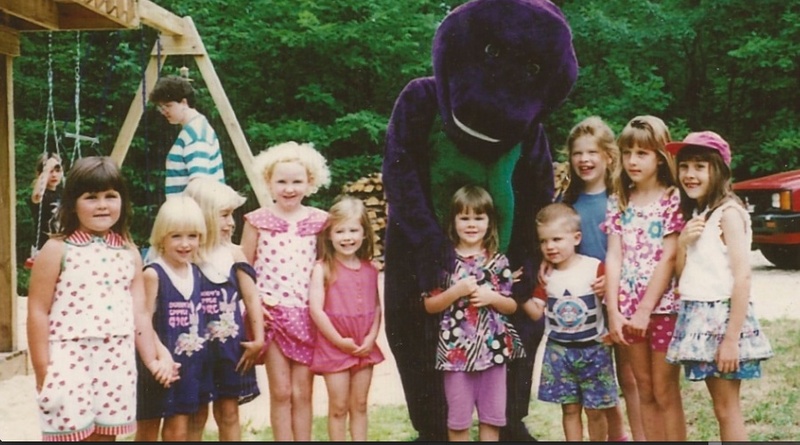 I also have a 20 year old and we had the exact same dark purple Barney at her third birthday party. It’s like you put my heart on speaker phone. “You put my heart on speaker phone”. I love that, thank you!!! Yes, indeed!! This mom of four, who once felt like Wonder Woman, has been reduced to a deer in headlights. Dazed.